when you're pregnant, you can't take anxiety medicine. or at least that's what the doctors tell me (and i think i'd go off them anyway just cause it feels smarter...what with the tiny developing brain and all). 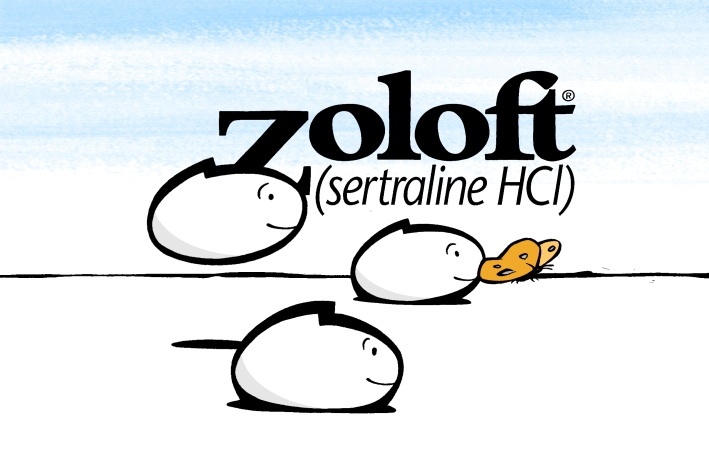 i've been on zoloft (or the generic equivalent) since a little before getting pregnant with layla (stopping for that pregnancy). i recently told a friend who asked about going on "these types" of meds that it was like taking a multivitamin: there was really no difference day in, day out (unlike with, say aderall, the first molecule of which you feel hitting your brain and immediately making changes), but after like a month or so, you, and those around you, will probably have noticed an overall change. it makes butterflies taste SO good. i never noticed how much of a difference the medicine has made until i went off of it when i found out i was pregnant this time. usually when we are "trying" (giggle) i go off of it slowly, the recommended way where you take half a pill for awhile and then stop. but the timing of this pregnancy was slightly surprising and i ended up with-child sooner than expected so i just flat out stopped taking the zoloft after 3 straight years on it. WOOOOO BOY how did i ever live without this stuff? life now seems completely impossible, overwhelming and everything makes me angry. granted, some of this is probably adorable pregnancy hormones. but that crawling/strangley feeling creeping up my neck as i seem to have less and less emotional strength to give to my life-- that is familiar and has nothing to do with pregnancy. i remember this and it is just awful and crippling and satan. now, as a jesus-person (official term), i know that i have access to christ's unlimited grace and that he wants to grow me in maturity and help me and that he is all i reeeeeeally need. but i also wear my seatbelt, get yearly pap tests, happily go to marriage counseling and use prescription glasses. those are all really great things that jesus gave the ingenious mind of man the power to invent. i just go ahead and put my zoloft right in there with the rest of them. it's not cheating, it's not subverting the will of god. it's using whatever tools i have access to to become more like him. if i could be all-natural, and smoke an organic basil doobie to get there, i would. until i find that recipe on pinterest: pharmaceuticals. and, the simple fact and fruit of my story is, when i am on zoloft, i am simply more like jesus than without it. so what about now? i currently do not have access to this one tool (thanks to my fetal blocker). i was talking to jesse about this last night and he said, "yeah it's harder without it, but it's a good thing to go through." and i thought, THROAT PUNCH! no, i guess i actually agree. am i suffering without the help of the meds? yup. and the bible is pretty clear that suffering should be considered a good thing when it comes. i am spending a lot more of my relationship with jesus just straight up leaning HARD on him and begging him to carry me through the hairier of times when things get stressful and seem hopeless. and hey, thats a good thing. and it will be a good thing too when i'm back on my medicine. so that's what i'm using this season of life as a reminder of: he's making ALL THE THINGS work together for my good. whether it's a pill that does it in the background nice and simply, or a front-line assault (with me cowering behind him) against the lies that say i hate myself, my kids, my husband and my life. ALL THE THINGS for my good. can i trust that? like for really real? even when my analytical mind seems to find a million little lawyer-holes in the promise (what if i get paralyzed? what if jesse dies? what if my baby has a disability? what if zombie apocalypse? HOW ARE THOSE GOOD, GOD? I WANT ANSWERS! I WANT THE TRUTH! ), do i have the faith enough to just lean in and believe? to believe that i really can't handle the truth; the one where he loves me so freaking scandalously much that all my little what-if's can't even touch and aren't even operating in the same dimension as the Good that he has planned for me and has already done for me. i want to say yes (though really i'm more of a, "crap, i dunno, that sounds shady," right this minute). i am using this period to practice jumping into that YES more and more. flexing my sad little faith muscles and getting really sore in the process. i'm not gonna count down the days until i can swallow my favorite little pill again, because, as much of a difference as it makes, it's not where my really hope is (or at least should be). UPDATE 9/24/14: I talked to my OB at the appointment following the writing of this post and she didnt hesistate to urge me to get right back on my dose. She said of all the meds Zoloft is most researched and the safest known during pregnancy, and that it was by far a better "risk" than this unstoppable anger/anxiety/stress/rage. I felt my life return to me after just a week or two back on the meds. Definitely talk to your doctor...there are options! I gotta say, I went off Zoloft cold turkey when I found out I was pregnant with evyn- BAD. IDEA. My doc was like ummm are you insane? And technically at that point I was. I went back on it and continued to be for almost my whole pregnancy - and my little squirt is just as healthy as can be! I once went out with a (Christian) guy (who was in his residency) who told me on our first date that he thought that there was no such thing as mental disorders- everything that could be classified as a mental disorder was actually a spiritual issue. My Cymbalta-taking, Jesus-loving, medical-field working self just laughed. And didn't go out with him again. Jesus will give you the grace to get through this season and you'll be rewarded with a sweet little baby at the end of it! Your transparency is amazing. Thank you for that! love this post, and really your whole blog, because I love your honesty!! thanks for writing this. you are awesome.